Erich von Daniken, bestselling author of Chariots of the Gods, now presents astonishing new proof that there was once an "era of the gods" on Earth! Erich von Däniken, whose books have enthralled millions of readers around the world, now presents astonishing new confirmation for his revolutionary theories. 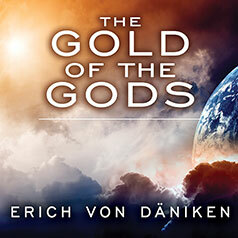 Erich von Däniken's The Gold of the Gods unveils new evidence of an intergalactic "battle of the gods" whose losers retreated to, and settled, Earth. He explores a vast, mysterious underworld of Ecuador—caves filled with gold and writings in solid gold that go back to the time of the Great Flood, bolstering von Däniken's theory of a prehistoric earthly "era of the gods."